The Museums Association of Namibia is a Non-Governmental Organisation representing museums and heritage institutions throughout Namibia. It receives an annual grant from the Namibian Government and has been tasked “. . . to facilitate the establishment of heritage institutions at regional and local level and to support such institutions by providing guidance, assistance and expertise where necessary and possible”. What does the Museums Association of Namibia do ? The Museums Association of Namibia has been officially recognized by the Namibian Government as the voice of Namibian museums and we lobby on issues of concern raised by our members. The Museums Association of Namibia supports and encourages the establishment and development of museums throughout Namibia. The Museums Association of Namibia actively seeks to encourage links between museums and other partners to enhance their role as educational resources and tourist attractions. The Museums Association of Namibia provides training to museum workers and encourages young people to consider a career in the heritage sector through an internship scheme. The Museums Association of Namibia is proactive to develop a heritage network in Namibia to encourage greater co-operation and communication between stakeholders in the heritage sector. The Museums Association of Namibia is involved in seeking the repatriation of cultural property held in museums overseas and seeks to prevent the illegal trade in cultural artifacts from Namibia. The Museums Association of Namibia actively participates in international bodies such as ICOM and AFRICOM to ensure that issues of concern to Namibia are raised at this platform. We also seek to build co-operative links with our sister organizations in neighbouring countries. 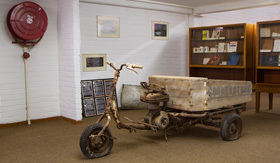 The Walvis Bay Museum was established in June 1978 through the combined efforts of the late former CEO (Town Clerk in bygone days) Mr. Jan Wilken, his secretary Mrs. Poppie Fox, MAN’S founding father, Mr. Günther von Schumann and the late Mr. Hein Altmann who collected most of the museum’s artefacts and information material.